Top 5 Criteria to Choose the Best Academic Writing Service ~ Visualistan '+g+"
There comes a time in every student's life when they have too much on their plate to handle every writing assignment they are given. These students are simply overwhelmed and they need assistance, but the school doesn’t offer it. Rather than given or miss their deadline, many of them turn to academic writing services. For someone who is using academic services for the first time, it is hard to know which ones to trust. After all, there are plenty of them on the internet. The good thing is that there is a criterion you can use to tell which academic services are the best and which ones to avoid. Some of these writing services are really out there to help students while others just want to make a quick buck. 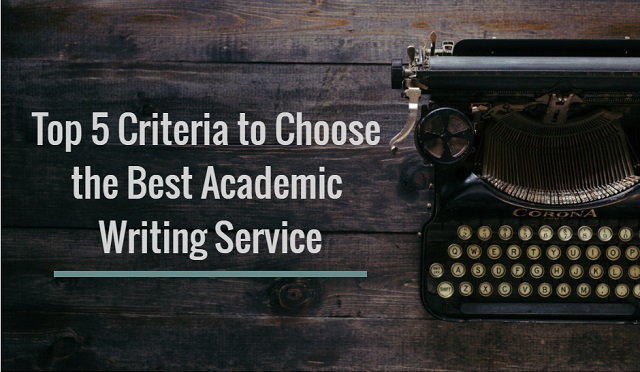 Keep on reading to find out the top five criteria you should use in order to choose the best academic writing service. As you will see, getting one that can write you a quality paper is not that hard. Before hiring an academic writing service online, it is best to make sure that they hire professional writers. If the writer who takes on your paper is not good, they can introduce grammar and spelling errors as well as factual errors in your paper. This means you will automatically lose marks or fail when you hand it in. Take a look at the service’s hiring procedure. All their writers need to be native English speakers to avoid grammar and spelling mistakes. They also need to be familiar with writing academic papers in terms of structure and formatting. And, most importantly, they need to be able to work under the pressure of a deadline and be able to produce high quality. One trick to verifying if a website hires professional writers is to interview the one they have matched you with. Based on the conversation you have, you can ascertain if they will be able to handle your assignment or not. If you notice poor spelling and grammar in the conversations you have, there’s no reason to believe it will get better when they write your paper. Plagiarism is a big deal in academic circles, and any writing services that prides itself on being the best needs to take it seriously as well. When a student gets caught plagiarising someone else’s work, the consequence can be grave. Some colleges and universities merely give offending students a zero, but others even go as far as suspending or expelling them. Some academic writing services and been known for selling papers that have been copied from other people. The worst academic services write one paper, store it in their database and then sell it to multiple students who seek one written on the same subject. All this lead to students getting caught for plagiarism. The best academic writing service does not plagiarise, and they guarantee this to their customers. In fact, after the writer is done writing the paper, they run it through a plagiarism check. If signs of copied content are found, the writer is told to revise those sections until the paper is unique. It's not guaranteed that all the papers handed in by the academic writing service will completely satisfy the receiver. When that happens, the student should be able to request revision and website should be able to do them free of charge. Before you hire the custom writing service, scan their website to see if they have a revision policy. If they do, go through it and know what your rights are in the event you’re not completely satisfied. Sometimes, you can get paper that is completely unsatisfactory. It could be such a mess or the writer could have missed the objective of the paper entirely. After looking at the paper, you discover that not even revisions can fix it. Your next course of action should be to request your money back and the writing service should oblige. When picking an academic writing service, go through the website and see if they have a money-back guarantee. This means that in the even of complete dissatisfaction, they will return your money in full. If the website is missing this crucial guarantee, you are best avoiding them since it would be apparent they care more about money than providing a quality paper. A student can need help at any time during the day or at night. Even when contact them at midnight, the writing service should be able to respond to your query in a timely manner. The last thing you want is to have a deadline looming in the morning, only for the writing service to return your messages or pick up your phone in the morning – when your paper is due. Furthermore, they need to be responsive and not take hours or even days to respond to you. They should get back to you in a timely manner, especially when you are requesting revisions or a refund (this is when bad academic writing services stop responding to your messages). Without academic writing services, many students who are overwhelmed would have missed their deadlines or fail their assignments. But not all academic writing services can be considered the best, considering that others know they can prey off the desperation of students. With the criteria outlined above, anyone looking for the best academic writing service can find one on the internet.